Here’s a reference to that old joke that asks which is bigger, the violin or the viola? (They’re the same size, but the violinist’s head is bigger!) “My Head is Normal-Sized. 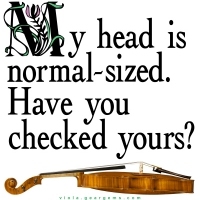 Have you checked yours?” is a design for violists, not so subtly directed at the big-headed, boastful violinists in their midst. Wear or display this design at the school or community orchestra rehearsal, and you’ll be a big hit! Buy this design now on any t-shirt, tote bag, mousepad, mug or other quality apparel or giftware item, exclusively from Bratsche’s Viola Bazaar!